Many government programs around the world have been created in an attempt to encourage changes in land management on privately owned lands, in order to enhance environmental conservation or natural resource management. These programs use a range of mechanisms to encourage change, including education, awareness raising, technology transfer, research and development, regulation, subsidies and other economic instruments. It can be difficult for project developers to determine which mechanism is best to use for a given project, so programs often rely mainly on a particular type of mechanism for most or all projects. This may or may not be the best mechanism for a particular project. Choosing the right mechanism for a project increases the chance that the project will deliver outcomes cost effectively. 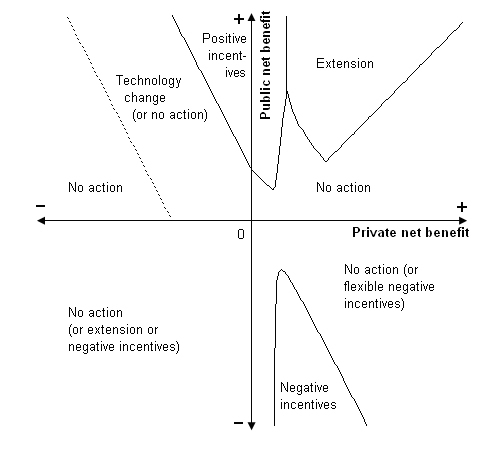 The choice among these mechanisms depends on the levels of public net benefits and private net benefits from the land-use changes being proposed. ‘Private net benefits’ refer to benefits minus costs accruing to the private land manager as a result of the proposed changes in land management. ‘Public net benefits’ means benefits minus costs accruing to everyone other than the private land manager. Defining them in these ways is helpful because the private net benefit dimension provides insight into the behaviour of the landholder, while the public net benefit dimension relates to the effects on everyone else that flow from the landholder’s behaviour. Efficient policy mechanisms for encouraging land use on private land, refined according to account for lags to adoption, learning costs, the fact that extension reduces but does not eliminate lags to adoption, the transaction costs of extension and assuming that managers require BCR > 2. The framework highlights the importance of targeting funds in environmental programs to selected areas, based on the levels of public and private net benefits. Currently, environmental managers do pay some attention to the level of public benefits when selecting their investments, but few pay adequate attention to the level of private net benefits, which, perhaps surprisingly, turns out to be at least as important as a driver of policy decisions. There are two versions of a framework, the one shown above which takes into account many external factors as described in the caption, and a more simplified version. For the simplified version and for more information about the framework and when different mechanisms should be applied, use the links below. Full details of the Public:Private Benefit Framework, including full-length papers and a powerpoint presentation, are available here.